Do not add oil. It's not a stir fry. The oil will make the dish taste off-flavor. A non-stick pan works well for this dish. However, I use a cast iron pan which sticks somewhat. 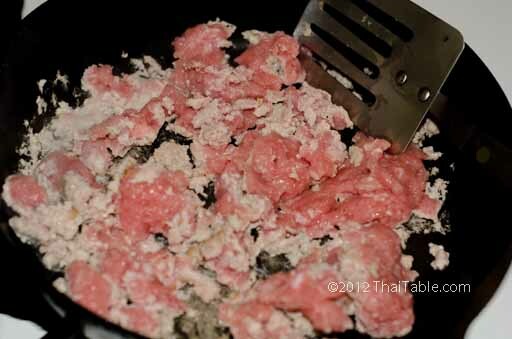 Add a tablespoon of water if needed to loosen the meat. Fish sauce or salt is optional. Some curry paste may have enough salt. Taste to see if you need to add more. You can use either salt or fish sauce. If your curry paste is very hot, you may need additional salt. The heat burns your taste buds and makes food seem underseasoned. Several recipes call for sugar. I recommend against it. Sugar has very little role in southern savory dishes. To get the true southern flavor, salt and heat are keys. Wash the lime leaves. Pull the double leaves apart and pull the center stems out from the smaller leaves. Stack them up and roll them tightly. Thinly slice kaffir lime leaves into threads, thin as you can. An extremely sharp knife is very helpful. Use a non-stick pan if you have any. I like my cast iron pan. Heat up the pan until hot add the pork. Do not add oil! Turn down the heat to medium low temperature. Stir to break up the pork. You see the juice will start to come out. This juice will release the pork that is stuck to the pan. Stir the meat until the meat is dry and all the juice has evaporated. It should take about 5 minutes. 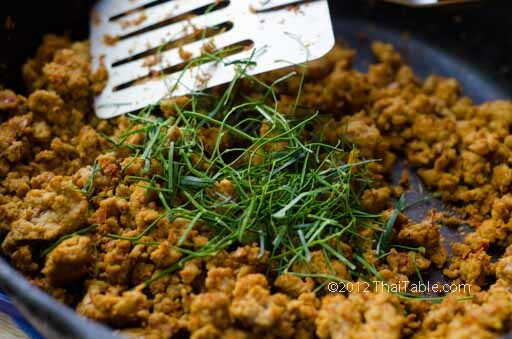 Add the southern curry paste and stir to mix it with the pork. Keep stirring until the pork is cooked, about 5 minutes. The goal is to cook the meat until it's cooked and dried. 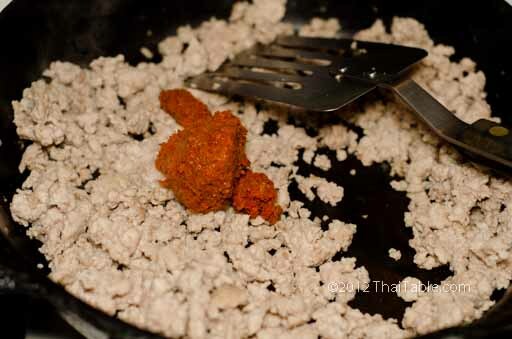 The meat should be yellowish from the turmeric in the southern curry paste. 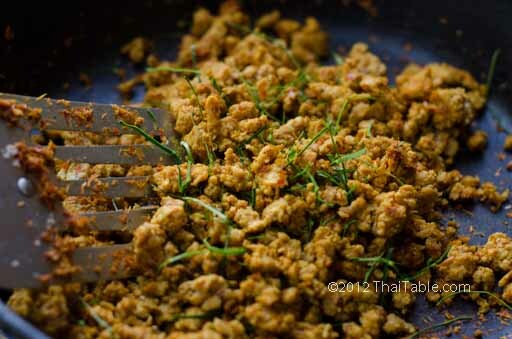 When Kua Gling Moo is ready, add half of the sliced kaffir lime leaves in. 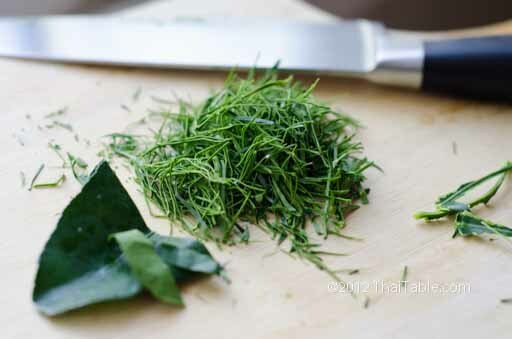 Stir to mix the kaffir lime leaf threads in. 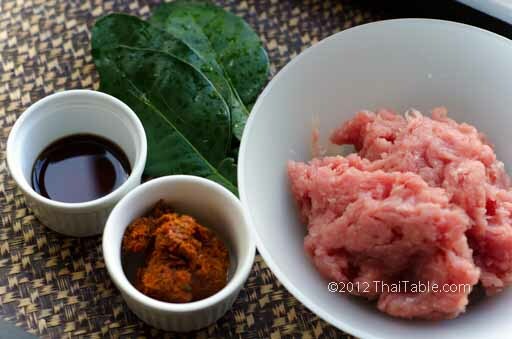 Pour the Kua Gling Moo on a serving plate and sprinkle the rest of kaffir lime leaf threads on. Serve hot with jasmine rice. To tone down the heat, serve Kua Gling Moo with fresh vegetables like cucumber, Thai small eggplants, salad green, green beans, cabbage and napa cabbage. 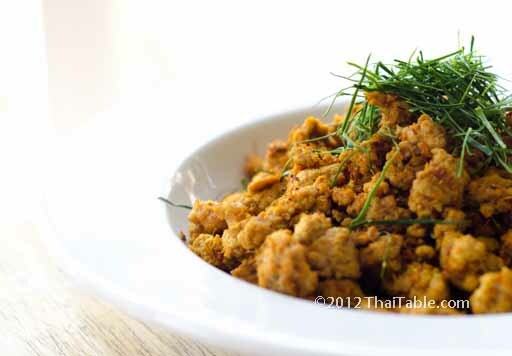 If the meat is thoroughly dry, it stays good in the fridge for several days. Reheat in microwave and enjoy with rice as a quick fix.